Warning: the following passage contains a very graphic description of the execution of four criminals condemned for arson by Commodus in the 2nd century CE. Reader discretion is advised. "Upon each platform had been erected a wooden cross, from which hung a condemned man. All four were arsonists, whose crimes had been committed at Brundisium and Capua in the south, Aquileia in the north, and at Rome. They each wore a tunic, but it was no ordinary tunic: it was black, and glistened in the sunlight. Each of the condemned wore the tunica molesta: the garments had been soaked in pitch. The arsonists were to be punished according to the nature of their crimes; they were condemned ad flammas...they were to be burned alive in the arena. When they saw the four convestores entering the arena, the condemned started to scream and moan, begging the crowd for mercy. The crowd screamed back at them. They turned to the Emperor, their faces contorted in terror. Commodus merely smiled, gave them a friendly wave, and sat back comfortably. Each confector carried a burning torch, which would be touched to the tunica molesta of each criminal. As they watched the approach of the confectores, two of the condemned lost control of their bowels. When he saw the faeces running down their legs, Commodus turned to those nearest him with an indulgent smile, as if sharing in some witticism at a theatrical performance. I came upon this horrific description of death by tunica molesta when I was researching the history of this form of execution after reading about it in Adrienne Mayor's text "Greek Fire, Poison Arrows, and Scorpion Bombs: Biological & Chemical Warfare in the Ancient World . Although many of us have read about Nero executing Christians suspected of arson after the Great Fire in 64 C.E. by using them as human torches, I didn't realize that this method of execution, like crucifixion, had been used routinely for such crimes as arson and treason in the Roman world before that time. 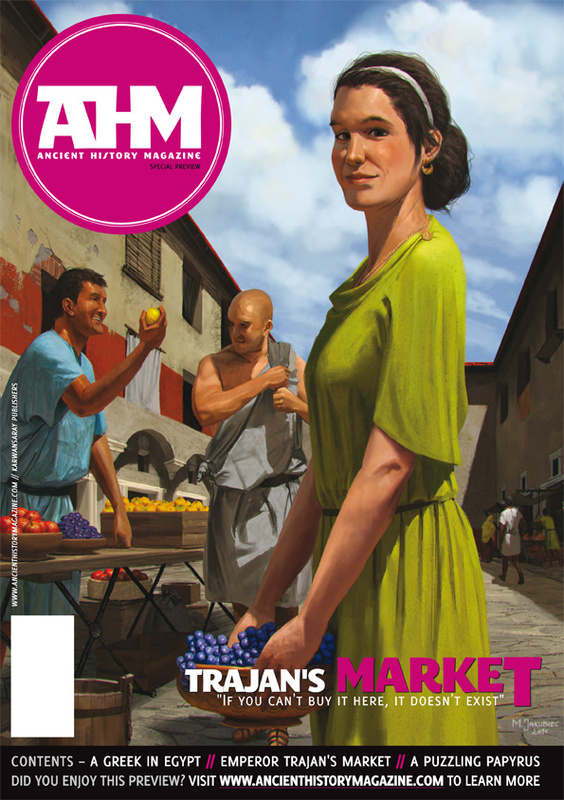 I don't know why I had not considered this before because I knew that the Romans often used mythological reenactments with criminals to entertain the crowds at Roman games and certainly the death of Hercules, one of the most revered demigods of the Roman pantheon, by a burning poison garment would have figured prominently as a choice. 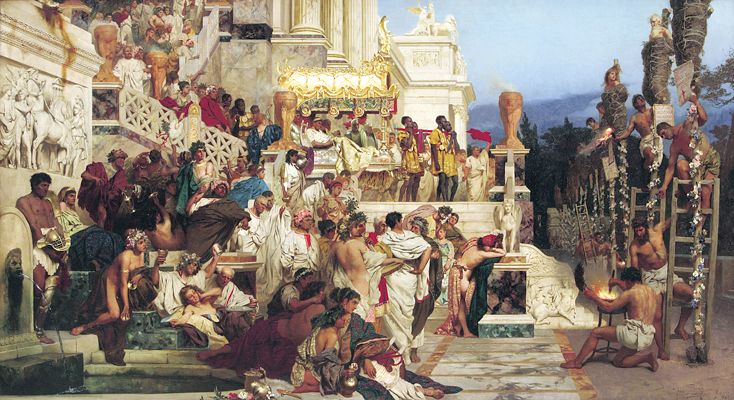 Execution "ad flammas" was actually one of the specified methods of execution in ancient Rome's governing XII Tables. "According to the XII Tables men might be bound, beaten, and burned alive (vivicomburium, damnatio ad flammas, vivus uri, crematio) as an ancient penalty for treachery and arson. This was rare under the Republic, but the Roman masses knew the violent use of fire as a threat and as vengeance. More common under the Empire, execution by fire was mostly for slaves and the lower orders (humiliores) for arson, desertion, magic, and treason, and it was an especially common punishment for Christians." - Donald G. Kyle, Spectacles of Death in Ancient Rome (Approaching the Ancient World) . Politically capitalizing on the spectacular nature of this mode of execution probably did not occur, though, until the "age of senatorial ascendancy" during the Punic Wars. "Elite Romans had long used elaborate funerals to reinforce familial claims to status, and they would later use imposing monuments and tombs as more enduring symbols. 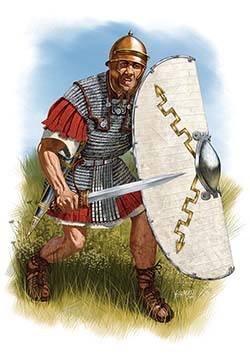 Just as the feasting and circus and theatrical games of triumphal ludi were vindications of awarded dignitas, the innovation of the gladiatorial munus on a limited almost experimental basis in 264 [BCE] allowed families, under the pretext of honoring a dead relative to display their claim to status. 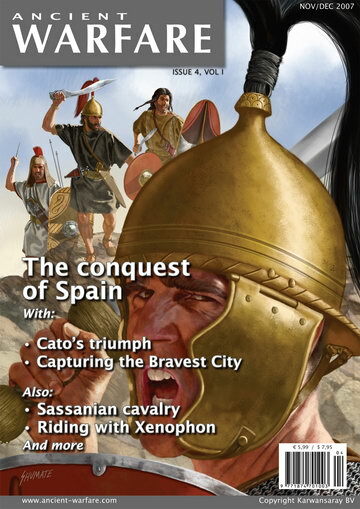 With the wars against Carthage and with elite families vying for consulships and thus generalships, demonstrations of the destruction of foreign captives, rebel slaves or deserters, or exotic beasts from the expanding limits of Roman power seemed entirely appropriate fro the military leaders of a burgeoning empire. Through the era of the Punic Wars, often called "the age of senatorial ascendancy", the nobles entrenched their control. From the magnitude of the Punic Wars to the Roman atrocities in Spain, Romans fought "total' wars against non-Italians and became more tolerant and even expectant of public brutality. In the same period munera [funeral games] and venationes [beast hunts] expanded in scope and frequency as the provision of spectacles of death was becoming more and more politically advantageous." - - Donald G. Kyle, Spectacles of Death in Ancient Rome (Approaching the Ancient World) . The adoption of many aspects of Greek culture that occurred after the conquest of Syracuse in 212 BCE might have also had an influence on the introduction of criminal execution in public spectacles. Plato taught punishment in the form of pure retribution should be condemned as animalistic and pointless. As Roman nobility began to study the works of the Greek philosophers perhaps they rationalized these spectacles were a means to invoke humiliation in the miscreants thereby restoring social order, a loftier ideal than simple retribution. This viewpoint was later expressed outright in the writings of the Middle Platonist L. Calvenus Taurus of the 2nd century CE but could have been shared earlier by Roman adopters of Greek philosophy, especially since it socially justified these activities and drew attention away from the political benefits reaped by these Roman magistrates. In her paper, Fatal Charades: Roman Executions Staged as Mythological Enactments, K. M. Coleman also points out that the mockery of criminals at such public spectacles also served to dissociate and distance the onlookers from the individual whose behavior had been declared unacceptable by the state. But, without properly equipped permanent facilities for these entertainments before the 1st century BCE, large scale reenactments of mythological narratives could not be properly presented. Perhaps this explains why the use of the tunica molesta was relatively rare until then. people sentenced to death ad bestias. by Mary Harrsch © 2006. When the Flavian amphitheater was finally completed under the reign of Titus, the son of Vespasian certainly took full advantage of the degree of spectacle that could be presented in the new facility. The Roman Emperor 1st century CE. 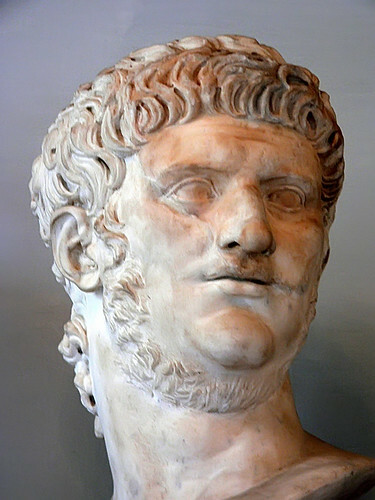 Some writers claimed many of the Roman people had objected to the cruelty of Nero's executions ad flammas but the people must have had a short memory! Coleman also pointed out that executions ad bestias were the real crowd pleasers but acquiring beasts was expensive and there was always a degree of uncertainty about the willingness of animals to "do the job". Death by crucifixion, on the other hand, was usually too slow, taking hours or even days. So the tunica molesta could have been an alternative means of execution that still provided a certain degree of entertainment while being relatively cheap with a guaranteed result. Coleman mentions that evidence of ongoing "fatal charades" disappears after the Severan dynasty but executions by fire certainly continued. Ironically, it was a Christian emperor, Justinian (r. 527-565 CE) who decreed that heretics would be put to death by fire as part of his Codex Iustiniani (CJ 1.5. ), ratifying the decrees of his predecessors the Emperors Arcadius and Flavius Augustus Honorius. Burning was also deemed the appropriate punishment for Zoroastrians in the Byzantine Empire for their worship of fire. I'm just wondering what the classical source is for this rather fanciful account - if any? Of course, I noted when I read Barry Strauss' "The Spartacus War" that incorporating this type of imagined scene based on historical events is the new style of non-fiction history presentation. I personally find it more interesting to read than a dry recounting of available facts that have typified non-fiction works in the past.